The Kuan Yin Royal Ease posture is one of the most frequently-seen forms taken by images of Our Lady of the East. To the modern Western mind this pose may be seen as a simple artistic convention but, as we shall see, the canonical poses (or asanas, with their attendant mudras) of Divine iconography are an exact science whose purpose is not only to convey intellectually, but to enact ritually, particular Sacred Realities. Thus the canonically correct statue or image has an inherent Grace and can convey a minor darshan (saving sight) upon the devotee. The correct term for the Kuan Yin Royal Ease posture is Lalitasana or Rajalilasana. The term asana will be familiar to anyone who has ever tried Hatha Yoga. It means simply "posture". Lalita is a name of the Supreme Dea, meaning literally "She Who plays", while rajalila means "Royal play". Thus the translation "Kuan Yin Royal Ease Posture" for this asana is slightly misleading. "Lalita Posture" or "Posture of Royal Play" would be more accurate. Why does this matter? Because the concept of lila, or play, is of important cosmic significance. Creation itself is seen as "Divine Play". Sri Lalita is so called because She is the Creatrix. All Creation is Her Play. 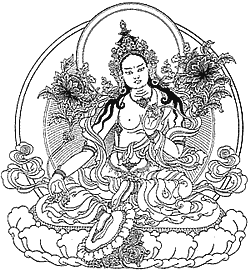 Only Buddhas who have a Cosmic, rather than a merely earthly-historical, significance are depicted in this pose, and the Kuan Yin Royal Ease Posture depicts the original Creatrix Herself: the true Lalita. The Kuan Yin Royal Ease Posture takes two forms. In the first, as shown above, the right knee is raised and the right forearm rests on it; the left leg is on a lower level and the left arm extends downward to a resting position and sometimes a little outward. 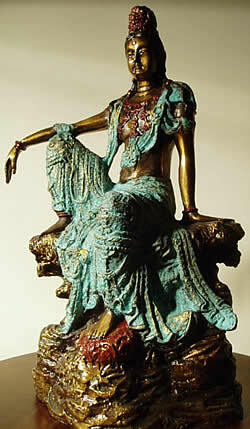 There is another version of the Lalitasana, which is more often seen in depictions of Green Tara. In this version, the left leg is in the Lotus Posture and the right extended forward and down. She is enthroned on a lotus, and the right foot often rests on a secondary lotus. The right hand rests on the right knee in the mudra (gesture) of boon-granting (comparable to the Distribution of Graces posture in statues of Lady Mary) and the left hand is raised in the refuge-granting mudra. While this version is more often associated with Green Tara, it is also a recognised form of the Kuan Yin Royal Ease Posture. 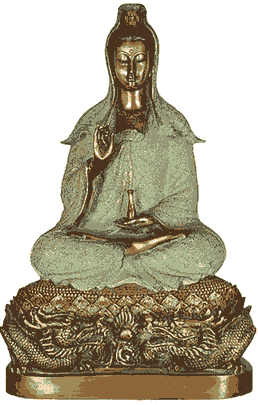 The other main seated position of Kuan Yin has Her in the full-lotus asana. Different mudras may be combined with this posture. She may even be "thousand-armed". The Kuan Yin Royal Ease and Kuan Yin Lotus postures correspond to the seated figures of Green Tara and White Tara respectively. As we have explained in our page on the Two Taras: from a Filianic point of view, they may be seen as representing the Daughter-stream and the Mother-stream. The same may be said of Kuan Yin, although she is not explicitly divided into two Divine Persons. The Lotus Posture represents the serenity and unacting-action of the Mother, while The Kuan Yin Royal Ease Posture represents the activity of the Daughter Who has descended into the samsara for our salvation. Traditionally, the Lalitasana symbolises rule over the material world and its possessions as well as the spiritual realm. The Daughter in Filianic tradition is called Princess of the World, Priestess of the World and Queen of Heaven. Similarly, Sri Mahalakshmi, like Sri Lalita, grants "both worldly enjoyment and liberation". The Kuan Yin Royal Ease Posture (the one shown at the top of this page) is fully active. Both legs are in active (that is to say outward-directed) positions, while in the lotus posture both are in-drawn. In the version of Lalitasana most associated with Green Tara, the left leg is indrawn and the right outward or active. Thus the Daughter (Green Tara) receives from Her Mother's serenity with her left, or receptive, side and gives to Her Children with Her right, or active/giving, side. Since Kuan Yin is represented as a single Being, Her Iconography more often shows her Daughter-aspect as fully active and Her Mother Aspect as fully serene. A question may arise in the Western mind as to why Activity should be associated with "Ease". As we have said, "Ease" is better translated by "Play" (lila) and represents the ceaseless Play of Creation. Nevertheless, the "Ease" element is also present, and should be understood partly in the light of the fact that to contemplative cultures, such as the Asian cultures, the highest form of activity is meditation. Compared to this supreme spiritual effort, outward activity is considered more akin to ease. In traditional thought everywhere, the contemplative, or Wisdom, aspect of any undertaking is considered superior to the outwardly-active, or Method aspect. Naturally this is true to an extent even in profane activities – on their own level. The planners and directors of any enterprise are always superior to the workers. But in a society like that of the modern West, where outward activity has become an end in itself, true Wisdom is absent, and we have the reign of pure Method. "Science" itself – the real "religion" and "mythos" of the modern West – is an activity that takes place purely on the side of Method from the traditional point of view. That is to say, it is purely concerned with material things and with physical experimentation and its results. The Solar Mother, whose brightness is "too great for us to look upon", is represented in the lotus posture, serene and unmoving; while the Lunar Daughter, who transmits her Mother's light in gentler form, is represented by the Kuan Yin Royal Ease Posture because She is outwardly active. Naturally, the brighter Light is that of Serenity, for Wisdom is always superior to Method. "Earth moves but Heaven is still. The rim revolves but the Center remains without motion". To the Eastern mind, as once to the Western, the idea that Stillness is the higher function and Activity the lower seems perfectly natural. We must also ask one last question, which touches upon the deeper complexity of this idea, and also upon the Spiritual subtleties of the Feminine Trinity. We have associated the Kuan Yin Royal Ease Posture with the Creatrix and also with the Daughter. But surely the Mother is the Creatrix of the World? That is true. But from our perspective, as beings in samsara, the Daughter's Sustaining function – the act of creating the world in every instant, lest it fall back into voidness – is the Act of Creation that is nearest to our perception. There is also another aspect to this. On the highest level, the Mother's Act of Creation is pure Activity, as opposed to the pure Non-Activity of the Dark Mother, so we may also see the Kuan Yin Royal Ease Posture as representing the Mother. One might go into yet greater complexities on this matter, but it is not necessary from a devotional point of view: and these images are first and foremost, foci of devotion and adoration. As always, we may take Filianic thought as "literally" as we wish to. We may regard the Kuan Yin Royal Ease Posture as representing the Daughter in a purely Filianic way, or we may see it as an aspect of the Mother, Who is the Cause of all being and the all-compassionate Creatrix of the Universe. In truth, She is both; and the play – lila – between them in our hearts is a valuable and beautiful part of the Way of Devotion.